Event organizers for Super Bowl LII are taking extraordinary steps to minimize the risk of infection for football fans flocking to Minneapolis for the big game. 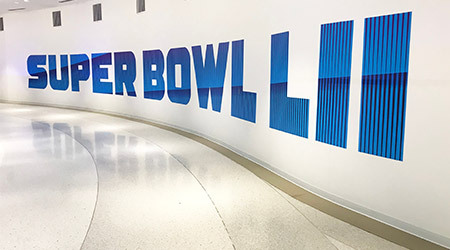 According to Fox News, the cleaning staff has been working overtime to disinfect the massive Super Bowl Experience exhibit at the Minneapolis Convention Center. It’s estimated that roughly 1 million people will attend game-related events leading up to kickoff. With flu threats growing, organizers are making every effort to create a healthy experience. According to Minneapolis radio reports, event staff has been wiping down hard surfaces multiple times a day with sanitizers and disinfectants. Volunteers with United Way have also been disinfecting virtual reality equipment between each use in an effort to prevent cross-contamination. In addition to the ramped-up cleaning efforts, healthcare providers are “strongly recommending” people in crowded areas wash their hands more often and avoid touching their eyes, nose and mouth. Organizers are encouraged to regularly check soap, sanitizer and paper stocks to make sure visitors have the tools necessary to keep hands clean.